Lifecycle: Complete metamorphosis with 3 instars and 1 generation per year. Immature/larval stage: White to creamy-white, soft bodied curl grub up to 25mm long. Three sets of legs with a hard, light brown head capsule. 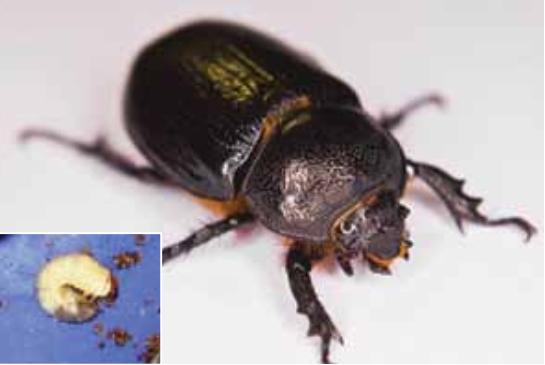 Mature/adult stage: Shiny jet-black scarab beetle up to 15mm long with serrated front legs. Main period of damage: Damage resulting from larvae feeding from spring through to late summer. 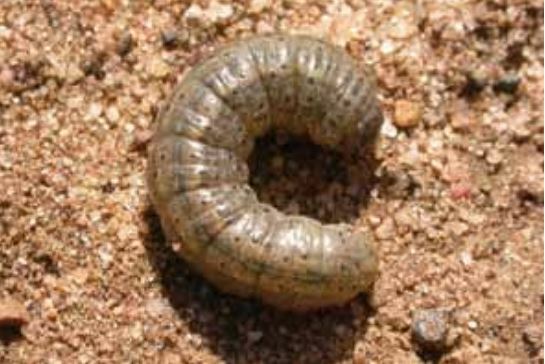 Immature/larval stage: White to creamy-white, soft bodied curl grub up to 25mm long, with three sets of legs and a hard, light brown head capsule. 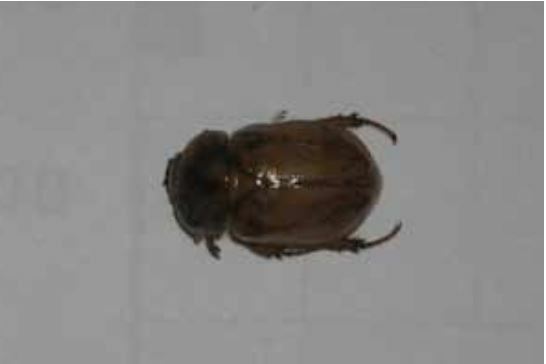 Mature/adult stage: Olive coloured scarab beetle with brown markings and a soft shell, up to 15mm long. 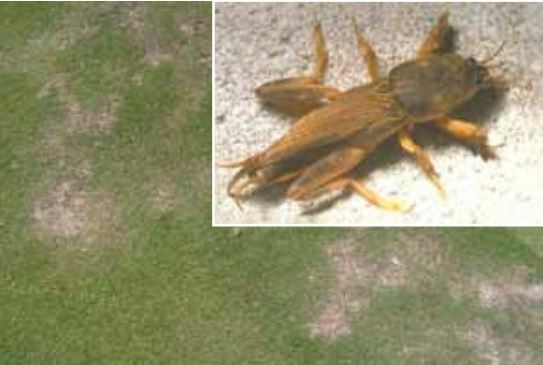 Main period of damage: Damage resulting from larvae feeding throughout summer. Lifecycle: Complete metamorphosis with 5 instars and 2-3 generations per year. Immature/larval stage: Legless, creamy-white, active larvae up to 4mm long. Mature/adult stage: Dark grey to black weevil with mottled grey body markings and a distinctive protruding snout, up to 3mm long. Main period of damage: Damage resulting from larvae feeding from spring through to summer. Lifecycle: Complete metamorphosis with 6 instars and 1-2 generations per year. Immature/larval stage: Legless, creamy-white ‘C’ shaped larvae with an orange head capsule up to 10mm long. Mature/adult stage: Dark brown to black weevil, with a distinctive ‘bill’ like snout, and elbowed antennae, with bodies up to 10mm long. Main period of damage: Damage resulting from larvae feeding from spring through to early autumn. Lifecycle: Complete metamorphosis with 6 instars and 2-4 generations per year. Immature/larval stage: Smooth bodied, dark coloured caterpillar with longitudinal lines and brown to black spots on back and sides. Mature/adult stage: A brown moth with a wing span up to 55mm. Fore-wings are purple brown with black markings and hind-wings are grey with brown markings. 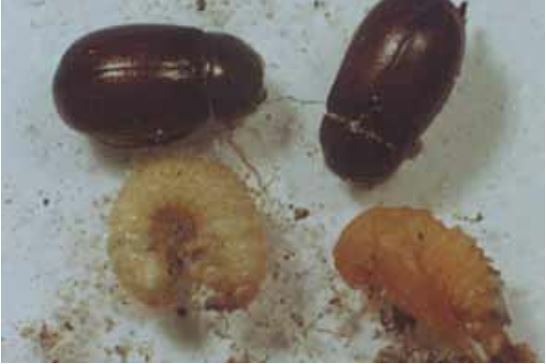 Main period of damage: Damage resulting from larvae feeding through autumn and winter. Immature/larval stage: White to creamy-white, soft bodied curl grub up to 25mm long. Three sets of legs with a hard, dark chocolate brown head capsule. 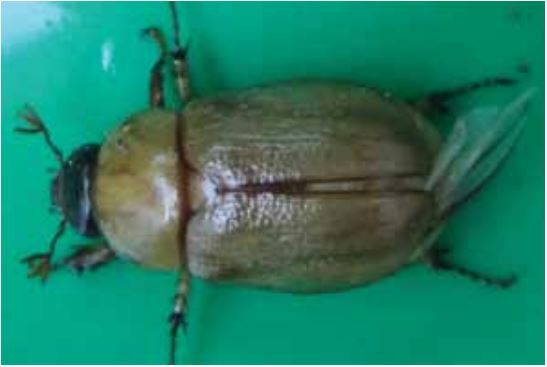 Mature/adult stage: Dark brown to black shiny scarab beetle up to 12mm long, with a distinct waist between the abdomen and thorax. Main period of damage: Damage resulting from larvae feeding from autumn through to spring. Lifecycle: Complete metamorphosis with 6 instars and 2-3 generations per year. Immature/larval stage: Small larvae up to 15mm long burrow into fruit following hatching. The entrance hole on the fruit can be observed. Mature/adult stage: Small light brown moth with a wingspan of up to 20mm and a round metallic mark at the end of each fore-wing. Main period of damage: Damage results from larvae feeding from spring through to autumn. Lifecycle: Incomplete metamorphosis with 1 instar and up to 5 generation per year. Immature/larval stage: White or grey smaller adult. 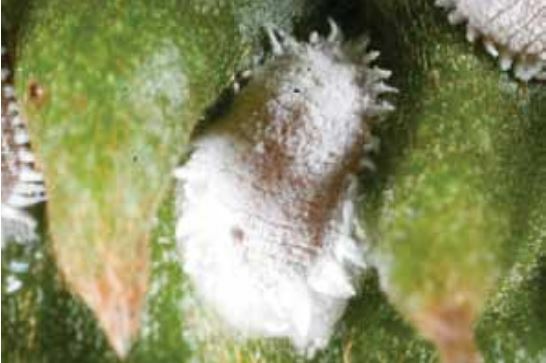 Mature/adult stage: Clam-shaped, mollusc-like scale insect with a white, armoured body up to 1.6 mm long. Main period of damage: Damage occurring from spring through to autumn. Lifecycle: Incomplete metamorphosis with 2 nymphal stages and numerous generations per year. 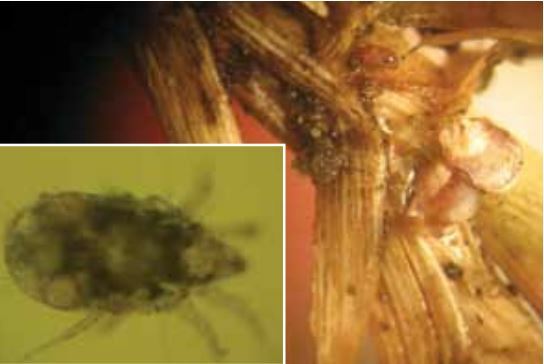 Immature/larval stage: Translucent bodied mite invisible to the naked eye up to 0.13mm long. 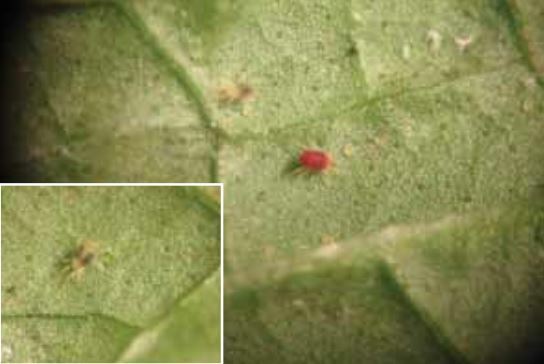 Mature/adult stage: Creamy-white mite with an elongated abdomen, body up to 0.2mm long. Main period of damage: Damage occurring from spring through to late summer. Lifecycle: Complete metamorphosis with 3 instars and 1-5 generations per year. 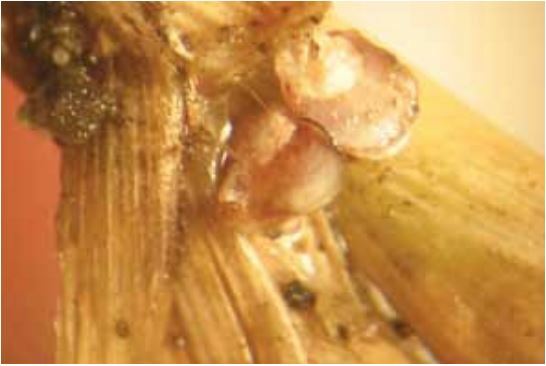 Immature/larval stage: Thin white maggots up to 5mm long. 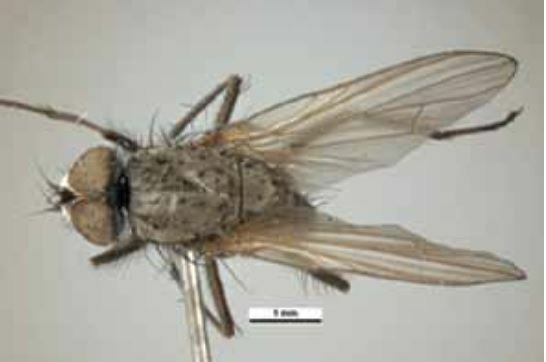 Mature/adult stage: Dark brown to black fly with large eyes and clear, narrow wings, body up to 3mm long. Immature/larval stage: White to translucent immobile larvae up to 2.5mm long, rarely seen as they are stored deep in the nest. 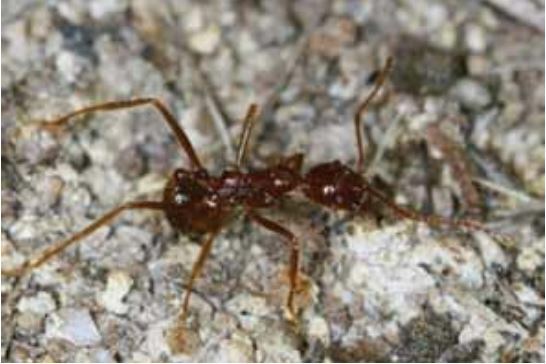 Mature/adult stage: Shiny, light brown ant up to 5mm long, with long, jointed antennae. Main period of damage: Damage resulting from nesting activities through the warmer months when the colony is active. Immature/larval stage: Resembles the adult but of a light green to yellow colour. Mature/adult stage: Pale to dark pink or red depending on the season, with a round body up to 1.0mm in length with short legs. Main period of damage: Damage occurring from spring through to summer. Lifecycle: Incomplete metamorphosis with one instar and a single generation per year. Immature/larval stage: Pale and elongate body to 5mm long, with legs and antennae. Mature/adult stage: A pink, globular-bodied pest with a large, soft abdomen and small legs and mouthparts clustered towards the front of the body, up to 4mm long. Lifecycle: Complete metamorphosis with 6-9 instars and 2-3 generations per year. Immature/larval stage: Soft bodied caterpillar with a dark body up to 45mm long, with white and yellow striped patterns along the back. Mature/adult stage: Pale brown moth, has a wingspan to 40mm, with a white spot in the centre of the forewing. Main period of damage: Damage resulting from larvae feeding from spring through to autumn. Lifecycle: Incomplete metamorphosis with 3 instars and 8 generations per year. 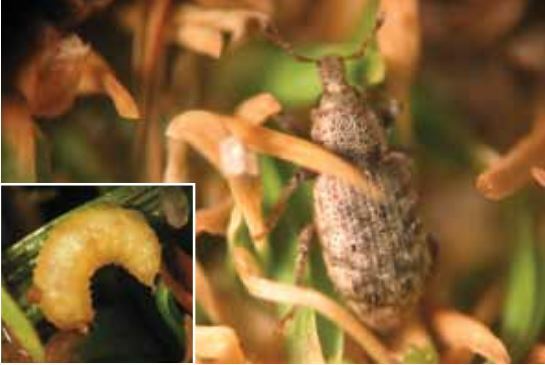 Immature/larval stage: Resemble the adult but to 0.2mm long. 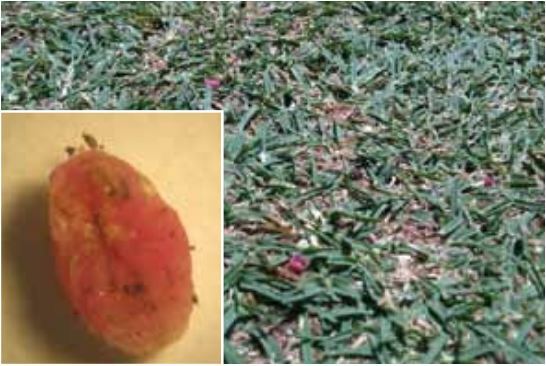 Mature/adult stage: Dark pink to yellow soft body up to 5mm in length, covered with a white, waxy secretion. Lifecycle: Incomplete metamorphosis with 1 instar and a single generation per year. Immature/larval stage: Resemble the adult but wingless. 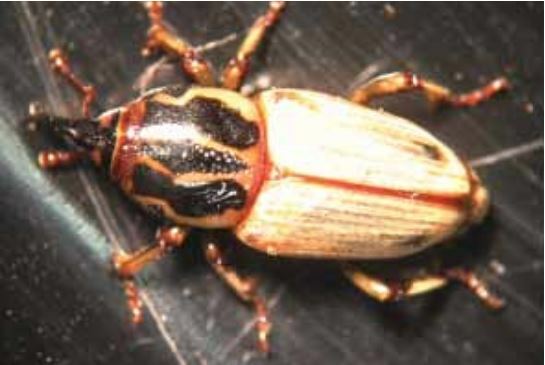 Mature/adult stage: A brown elongate insect pest with a hard, shiny head and wings, body up to 50mm long. Main period of damage: Damage occurring from spring and summer. Lifecycle: Complete metamorphosis with 3 instars and a single generation per year. Immature/larval stage: White to creamy-white larvae, soft bodied, up to 20mm long, 3 pairs of legs, hard light brown head capsule. Mature/adult stage: Dark brown to black scarab beetle up to 16mm long, antennae have club-like ends, and the underside of the body is hairy. Lifecycle: Complete metamorphosis with 3 instars and 2-3 generations per year. Immature/larval stage: White larvae with a soft body up to 25mm long, curled in a ‘C’ shape, with a reddish brown head capsule. 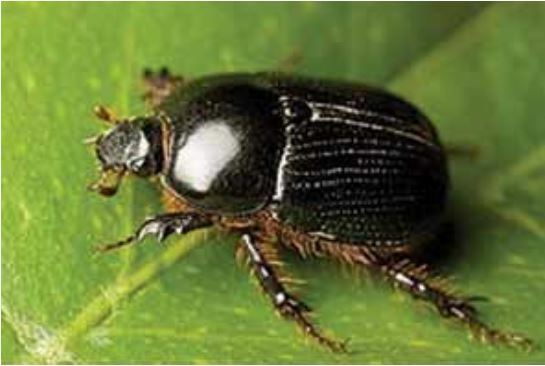 Mature/adult stage: Shiny black scarab beetle much like African Black Beetle, up to 12mm long. 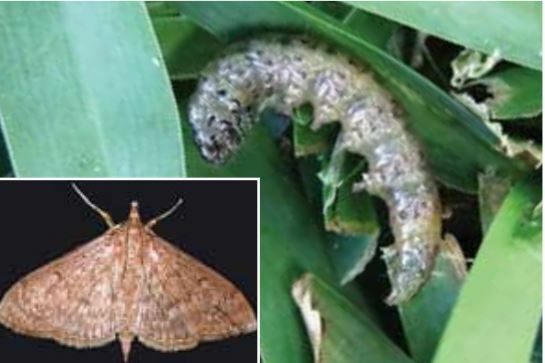 Main period of damage: Damage resulting from larvae feeding from winter through to spring. Lifecycle: Complete metamorphosis with 6-8 instars and 2-3 generations per year. 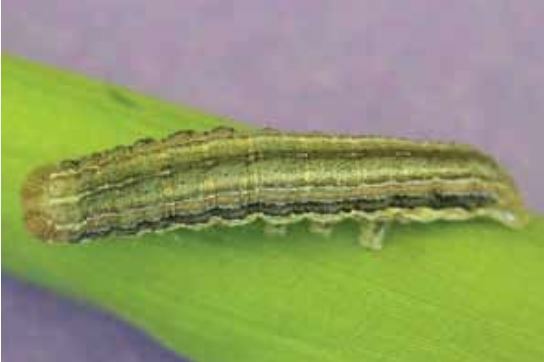 Immature/larval stage: Relatively think caterpillar up to 25mm long, pale green-brown body with dark spots. 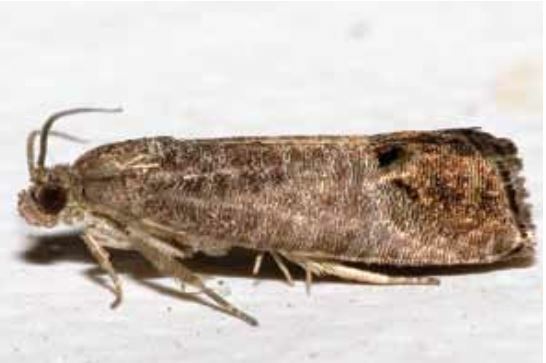 Mature/adult stage: Slender bodied moth with a wingspan of 2.5cm. Wings are grey with black spots and transverse dark wavy lines. 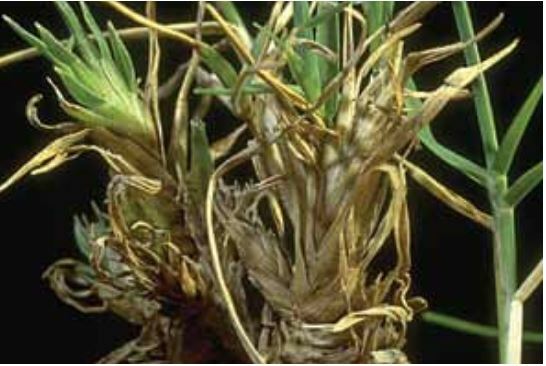 Main period of damage: Damage resulting from larvae feeding from late summer through to autumn. Immature/larval stage: Young females are pale bodied with a dark mark on each side; they are just visible to the naked eye. Mature/adult stage: As the females mature they often turn a darker colour, turning completely red in the cooler months. Main period of damage: Damage occurring from spring through to autumn, particularly in hot, dry weather.